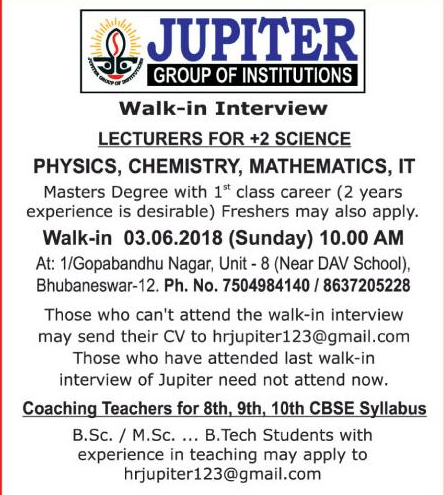 Jupiter Group of Institutions, Bhubaneswar has advertised in Sambad for the recruitment of Lecturers jobs vacancies. Interested and eligible job aspirants are requested to appear walk in on 3rd June 2018. Check out further more details below. About College: Like a good institution, Jupiter +2 Science College has established itself. Way back 2002, Jupiter emerged with a new concept to meet the growing demand for a quality +2 Science College. In course of 13 years' time the College has grown to one of the most respected & reliable +2 Science Colleges in Orissa. The college, ostensibly the largest in terms of students strength and one of the few widely networked +2 Science colleges of the country, has been innovating and incorporating many of the aspects for +2 Science education of which most would only talk about.